California has over 800,000 registered motorcycles, the highest in the nation. Motorcycles are a known danger: The national fatality rate for motorcycle crashes is 28 times higher than crashes involving other motor vehicles. California, and southern California in particular, sees so many motorcycle crashes that they only really make the news if they shut down a major freeway. In 2016, motorcycle deaths accounted for over 15 percent of all traffic fatalities in California, even though motorcyclists represent only 3 percent of registered vehicle owners nationwide. California authorities have been working to curb the problem, but the number of motorcycle deaths has been on the rise for over two decades. 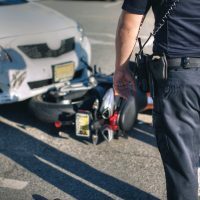 Continue reading for details about the growth in motorcycle crashes in California, and contact a skilled California motorcycle accident attorney with any questions about possible personal injury claims. According to a 2018 report from the Governors Highway Safety Association (GHSA), there were 2,320 fatal motorcycle crashes across the country in 1994. This number grew steadily until it peaked in 2016 at 5,286 fatalities, a 5.1 percent increase over 2015. Five hundred sixty-six of the 2016 deaths, over 10%, occurred in California. Over 14,400 motorcyclists were injured in California as well. While in previous years younger riders had the largest share of motorcycle deaths, in recent years the over-40 age group has taken over the lion’s share of motorcycle deaths. GHSA reports that the average age of motorcyclists killed in 2016 was 43. The main causes of motorcycle crashes, like with other motor vehicles, are speeding, distracted driving, and impaired driving. Alcohol-impaired driving was reported as the highest contributing factor leading to motorcycle deaths, as it was for all motor vehicle types. For motorcycles, speeding was not far behind. Over a third of motorcycle crashes in 2016 involved people speeding and/or riding with a BAC over 0.08, the legal limit in most states. Motorcycles also pose additional dangers in terms of aggressive maneuvering, such as lane-splitting, and unlicensed and inexperienced riders causing dangerous situations. Nationwide, 27% of motorcyclists involved in fatal crashes were unlicensed. GHSA suggests that the rise in crashes has to do with increased alcohol use, marijuana decriminalization, excessive speed in part due to new, faster bikes, a rise in distracted driving, and climate change causing an increase in the number of riding days. All of these factors taken together have caused motorcycle riding to become more and more dangerous over the last two decades. There is reason to hope that the trend is shifting: The GHSA report shows a marked drop in motorcycle fatalities from 2016 to 2017, with California’s overall number dropping even more than the rest of the country. There were 406 motorcycle deaths in California in 2017, representing a 28.3% decrease from 2016. The national rate meanwhile dropped by 8.6%. The report takes pains to note, however, that the drop is in line with year-to-year variability and may not indicate an actual shift in the trend. If you have been hurt in an Antelope Valley motorcycle accident, talk to a seasoned and dedicated personal injury attorney about pursuing a claim for damages by calling the Kistler Law Firm in Palmdale at 661-206-6990.